How was your Valentine’s Day?! Are you still in a chocolate coma like I am? I kind of overdid it. But are you really surprised??? Now that we’ve all had our fix of chocolate treats, I wanted to share something comforting today, but in a savory way. And since it’s still too cold for my blood, I thought a soup would be the perfect thing! You guys loved the salsa verde chicken chili that I posted last year so I just had to try another chicken soup recipe. This one is also broth-based so you don’t have to worry to sticking to just one bowl of this delicious stuff. For this soup, I decided to draw inspiration from a cuisine that I’ve fallen in love with in the last year – Greek cuisine!! I talked all about my new-found love affair in this post for the Greek chicken quesadillas. If you haven’t tried these yet, what are you waiting for?! 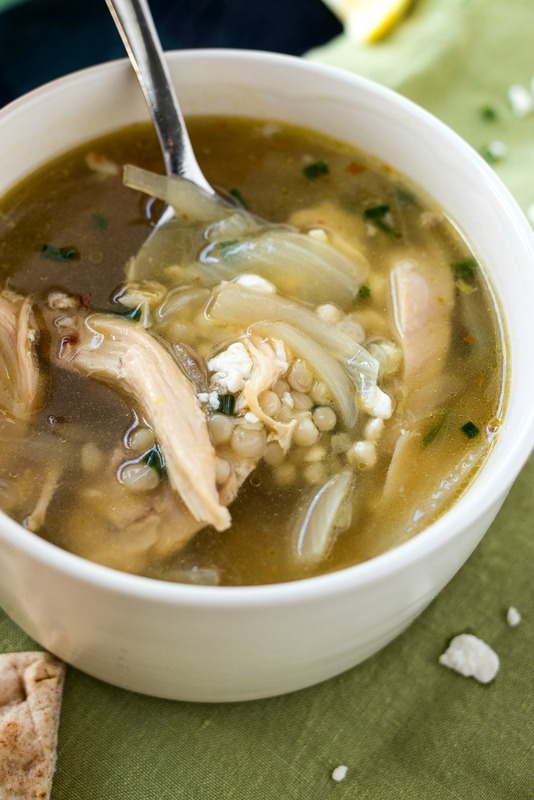 Okay back to the soup…check out my newest soup recipe – Greek Lemon Chicken Soup! The flavor of this soup is incredible – familiar yet with a little special something to excite your taste buds. You can thank the salty feta cheese and tangy lemon zest for that. But don’t worry – all that extra flavor isn’t gonna cost you any extra time in the kitchen. Like the salsa verde chicken chili, this recipe is extremely easy to throw together. And super quick to make, thanks to the rotisserie chicken breasts that are already cooked. So all you really gotta do for this soup is throw everything in a pot and cook together. That’s really all there is to it. And if you wanna keep the Greek theme going, feel free to us some pita bread for dipping. We loved it! Make sure to slice the onion in thin strips instead of big chunks. You want the onion to be a size that’s easy to eat. Speaking of the onion, you want to make sure you cook it enough in the first step so that it’s nice and tender before you add the rest of the ingredients. Plus, this is where all the flavor develops! Don’t add the feta cheese until the very end. Otherwise, the cheese may melt and break down too much and you won’t have those awesome chunks in the soup anymore. I used chicken breasts for this soup to keep it lean, but feel free to use thighs or even leftover turkey for this recipe. Add olive oil to a large Dutch oven and place over medium-low heat. Once the pan is hot, add the diced onion and minced garlic to the pot and cook until translucent (about 3-4 minutes). Add chicken broth, lemon zest, shredded chicken, and red pepper flakes to pot and stir to combine. Raise the heat to medium high and let it come to a boil. Once boiling, cover pot and lower to a simmer for 5 minutes. Add Israeli couscous to pot and stir. Add feta cheese and chopped chives and stir. Give the broth a taste and add salt and pepper, as needed. I didn't need any pepper since the red pepper added enough for my taste. But I still added a pinch of salt. Turn off heat and serve immediately. You put feta cheese in the soup?! *faints* I love feta cheese so much! I am loving all of the Greek flavors in this. Omg me too! Feta is so underrated! I love the way this looks…really want to dig in to it! Perfect right now no matter where you live too! I love this soup!!!! I have had it with rice and not orzo. I can’t wait to try your version. It looks delicious. You’re gonna love the couscous! I’m always looking for new soups to add to my winter lunch list. This one looks like a good addition! Yessss! Let me know how you like it! This looks so good…perfect for lunch or a snack! I eat soups for snacks all the time! I love that you added Israeli couscous!! It’s one of my favorites! I cant wait to try this!! This recipe has me reminiscing about a vacation I took to Greece years ago!! I’m going to have to try this out! Aw I really want to visit Greece! Wow, this sounds incredible! What an original take on chicken soup. Sounds so easy to make too! Ugh why do I always have to see your posts when I’m SO hungry! This looks and sounds absolutely delicious! Another one that I’m saving! Aw haha! Thanks so much! husband and stepson and they would love this soup! What a great take on classic chicken soup. And, I have most of the ingredients at home! Yay! I hope you had a chance to try it out! How delicious does this sound – you can never go wrong with a soup to warm your belly! Thank you for the great recipe, I will save this for when it starts to get a little chilly. This looks fantastic! I love all greek food, but have never thought of doing it in a chicken soup. Right?! I am so glad I have this recipe now! I love couscous but have never tried it in soup before! This recipe looks amazing and I can’t wait to try it soon! Pinned for later! Oh man you’re gonna love it – I KNOW it! I love a good homemade chicken noodle soup but I’m definitely loving the use of ccouscous and feta. Totally need to try this one! It’s a perfect day for this soup! What a delicious and comforting meal. It’s totally soup weather here! And I’ve been loving Greek flavors lately. Yay – hope you had a chance to make this yummy soup! This looks delicious! And I’m pretty much always looking for a reason to eat feta, so this is perfect! Ha!